As a child I used to hate beet. My parents always pickled it and I just could not stand having to eat beetroot salad on Sundays. Years later I’ve developed a taste for the pickled variety and even later for raw beetroot. The earthy taste and bright red flesh and juice intrigues me endlessly. A while ago, I bought beets to try out a new soup recipe, which I never got to. I’m not exactly sure why, it just did not happen. Yesterday I remembered that I still had some beetroot in the refrigerator and decided to try something with it. And it was delicious. Really. Wrap the beetroot and garlic in aluminum foil and roast in the oven at 150C for an hour. Remove and let it cool, be careful that the beetroot juices don’t spill. When it has cooled for a bit peel, chop and throw the beetroot and garlic into a food processor or blender. Add the cream, tomato paste, and oregano and puree. Add some salt and pepper to taste and serve over any cooked pasta you prefer. I was genuinely surprised about how well this came out. I was concerned that it might be too weird and earthy for a pasta sauce, but the cream and the other ingredients toned down the earthiness to a delicate hint in a really yummy pasta dish. 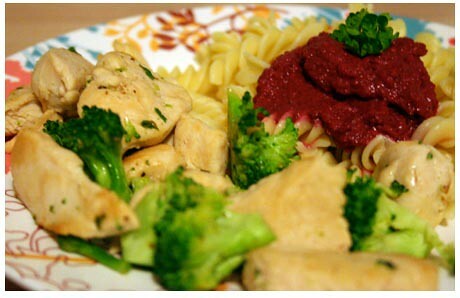 Oh, I served some chicken and broccoli friend with a bunch of freshly chopped parsley with the pasta. And there was enough pasta for about 4 helpings. Now go try it, no suggestions. If you have any though, let me know.